This is project no 2: bugle beads. They are so easy to do and so much fun. Of course they all came out of one single sheet of paper. There was even one more bead, but I prefer an uneven number, so I left it aside. I intend to a do a lot more of them, in different shapes and sizes, too. And of course in a variety of patterns and colours, so they will fit different styles and clothes. Cut the paper in strips of 2, 3 an 4 cm width. 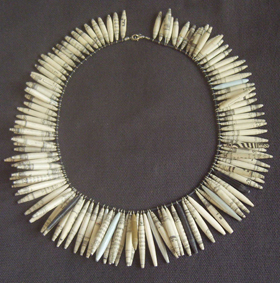 A length of 15 cm will do or the beads will become to bulky. Apply some glue to the beginning of a strip. Choose an eye pin 0.5 mm longer than the bead shall be and wrap the paperstrip closely around about 2 or 3 times. Now bend the surplus of the eye pin closely around the paper and tweeze tight. Put glue on the rest of the strip and carefully roll it up. Pay special attention to the end because you do not want it to come loose. 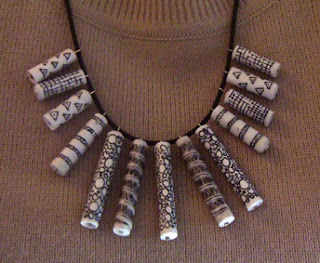 Wait for the bead to dry and then adorn it with a pattern of your liking. Paint 2 - 3 times with glue to make sure the bead is water resistant and the pattern will not rub off on your clothes. Thread all beads on a length of rubber cord and add a fastening of your choice. Of course you can vary the paper, the pattern, the colours, whether you want to take rubber band or maybe stainless steel, just as you like it. If you look closely, you can see that I added a few beads of different papers. Zebra striped e. g. or silver or gold and even black as highlights.